"Powerful--A gritty insider's tale as only a fighter pilot could tell it." The Marine Corps’ drive up the Tigris and Euphrates valleys during Operation Iraqi Freedom was marked by a combat relationship between its air and ground components that was unlike anything seen in the history of warfare—eclipsing even the sweeping Nazi Blitzkriegs of 1939-1940 in the fine choreography of its execution. 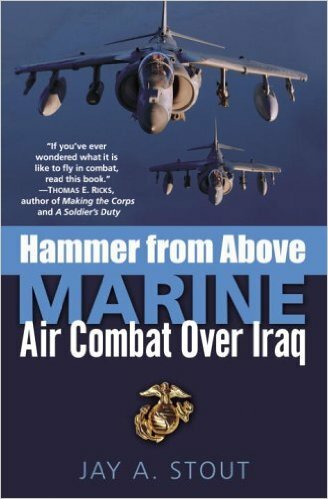 Hammer from Above—Marine Airpower over Iraq describes the aviation component of this campaign as no other work has done. Rather than simply a dry technical treatment of Marine Air Ground Task Force doctrine, and a rehash of the major actions with relevant statistics, Hammer from Above, gets into the cockpits of the aviators as they execute the missions. It labors alongside the young Marines who spend weeks at isolated outposts as they refuel, rearm, and repair helicopter gunships. It worries with commanding officers whose crews are flying combat operations in excess of eighteen hours at a time. It exposes the reader to the noise, the smoke, the fire, the stink, and the death of the battlefield. And it does so in a human and familiar fashion.